Private, indoor pool heated all year at 28/30°C, 82/86°F with counter-current device. Secured. Dimension: 3,70 x 9,50m; depth 1,40m. A paradise for children: pin-ball machine, baby-foot, table tennis, playground 'Castle Camelot XXL', large terrain to play boules (pétanque). TV, DVD, decoder satellite ASTRA. Garden kitchen: barbecue WEBER charcoal, plancha à gaz, paella stove with pan Ø 60cm, fridge. Villa extremely calm with view on medieval village Le Castellet and the Mediterranean Sea, no vis-à-vis. Pets accepted - garden of 1465 m² is closed. Bernadette (french), Nicolas (german); married in Le Castellet in 1971. Retired. Villa SANTA FE, a paradise for children: private indoor pool heated all year at 28/30°C, 82/86°F, pin-ball machine, baby-foot, table tennis, playground 'Castle Camelot XXL', large terrain to play boules (pétanque). Internet access free WIFI, WLAN, ETHERNET, TV DVD, decoder satellite ASTRA with a number of English speaking channels. Barbecue WEBER charcoal. Villa extremely calm with view on medieval village Le Castellet and the Mediterranean Sea, no vis-à-vis. Pets accepted - garden of 1465 m² is closed. 1 bathroom, bathtub, toilet, bidet, shower. 1 bathroom, shower, toilet. 1 bathroom, shower, toilet. 1 bathroom, shower. 4 toilets altogether. Parking for 5 cars available. Towels XL for shower and towels XXL for pool available. Salon equipped with TV, DVD, satellite decoder ASTRA. 1 fridge with freezer. 1 fridge XXL 350 ltr. Filter coffee machine ROWENTA. Capsule coffee machien NESCAFE DOLCE GUSTO. Pinball machine, baby-foot, table tennis. Plot of 1465 m², closed. Terrasse for 15+ persons seated. Indoor pool, heated all year at 28/30°C, 82/86°F. 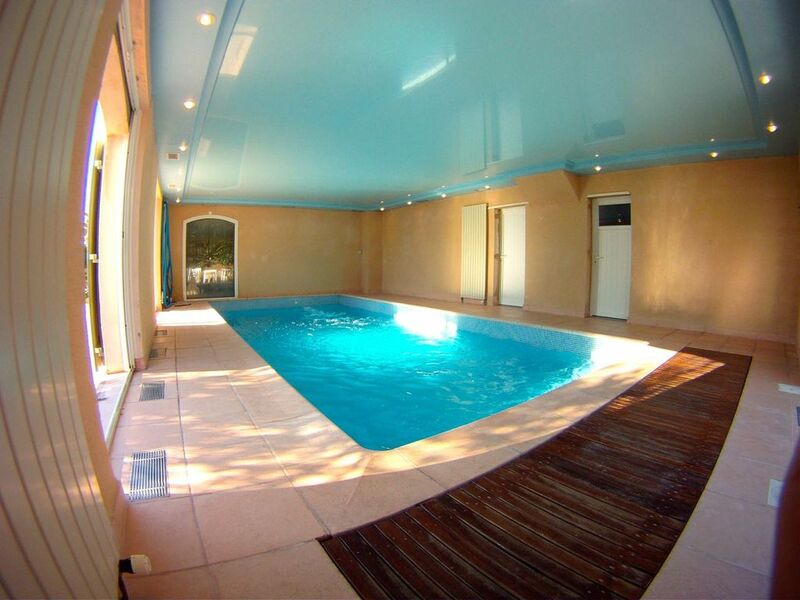 Secured, private indoor pool (4m x 9m) heated all year at 28/30°C, 82/86°F with counter-current device. High-leveled terrace (60 m²) with panoramic view. TV, DVD-player and ASTRA-decoder. Internet access, DSL, WiFi, WLAN, Ethernet free. Barbecue WEBER in the garden. Large boules yard. Additional equipment available: baby bed, baby chair, baby play yard, and pet basket. Amazing Villa! Awesome Stay! Wonderful Couple! Our Vacation in South of France will always be memorable and a huge part why we enjoyed was the amazing Santa Fe we stayed in. The villa is just fantastic! Perfect for big family like us. It has ample amount of space in and out and an awesome indoor, temperature controlled, swimming pool!!! The kids enjoyed the backyard play area. All five bedrooms are spacious and comfortable. The modern kitchen is well equipped! Wonderful terrace with a nice view and parking for 5 cars!!!! Very organized and well planned villa! The house is just unbelievable!! The owner, Mr. Klaus von Bothmer and his wife were very helpful, nice, accommodating, wonderful wonderful people! They were always ready to help, and they live just a few blocks away, so just call them and will be there in less than 5 mins!!! Overall, our family are very pleased by the space, comfort, cleanliness, of the house and tranquility of the surroundings. JUST PERFECT! By the way, they have another villa called SANTA ANA, just next to their house, few blocks away from SANTA FE, Mr. Klaus was nice enough to tour us around the house the day we were leaving France. And we were blown away!!!! Equally amazing villa! Merci Mr. & Mrs. Klaus!!! Eine wunderschöne Villa in einer schönen Lagen. Eine super Einrichtung und voralem neuwertig und sauber. Nicht nur die Villa ist großartig sondern auch ihr Besitzer. Ein hilfsbereiter, auf anrufbereitschafter und verständnissvoller Mensch. Trotzdem ist die Villa weiter zu empfehlen und ihren Preis wert. Belle villa pratique pour les grandes famille. Propriétaire sympathique à l écoute des vacanciers . Built on a hill with a panoramic view of the Mediterranean Sea, hills, plains, and the medieval village of Le Castellet. Views of the La Ciotat bay, the town of La Cadière, the plain of St. Cyr, and the bay of Bandol. You may visit the famous Calanques de Cassis (20 km). Within a radius of 12 km more than 50 wine-growing estates very near by invite you for wine tasting of Vin de Bandol AOC: the most famous ones are Domaine Ott (3 km) and Domaine Pibarnon (7 km). Golf-players will highly appreciate the Dolce Fregate Provence golf club in Bandol because of its location and its extraordinary views of the Mediterranean Sea. 8 km to St. Cyr beach. 10 km to Bandol beach. 14 km to Sanary beach. 70 km to Marseille airport. 48 km to Toulon-Hyères airport. 19 km to Toulon via highway. 50 km to Marseille via highway. Capacité couchages = 14 personnes, dont 12 lits adultes et 2 lits bébés (0 à 3 ans). Capacité couchages supplémentaires contre surplus – renseignez-vous.